Narcos is one of the Netflix stable’s prized stallions, and after a thrilling first season it’s renewal was an absolute given. The first season covered almost twenty years’ of Pablo’s life and showed the impossible events that led him to being one of the richest people in the world. 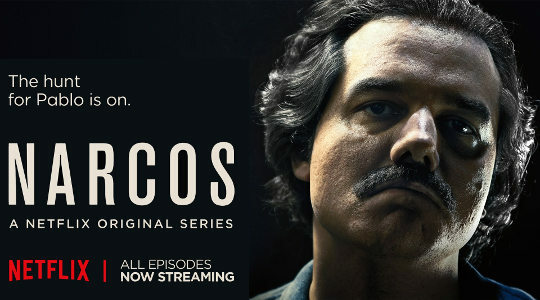 But after being imprisoned of his own back at the end of season 1, and then breaking out – season 2 was about catching Escobar and putting an end to his own Colombian empire. Season 2 of Narcos showed the same steeliness and intensity, with a wild ride along the way, but managed to lose it in a more drawn-out story of Pablo Escobar’s fall from the headiest of heights. Wagner Moura was once again fantastic in playing Pablo Escobar, and this season he managed to step-up the role and give it more humanity in what was a completely different environment for Pablo. Now he was faced with his crumbling empire, family and friends deserting him – and despite the rage and revenge you’d expect from a cornered drug baron he manged to make him sympathetic too. With Moura being the stand-out from the first season, it made sense that this part of the story focussed more on him – but the supporting cast were just as good too. The stories of DEA agents Murphy (Boyd Holbrook) and Pena (Pedro Pascal) showed the toll it was taking on them in their hunt for their target. Personal and professional sacrifices needed to be made, and their partnership frayed at the edges too through the action flashpoints that made up most of their season 2 appearances. The most interesting side story was that of Escobar’s new driver, Limón (Leynar Gomez), and his childhood friend Maritza (Martina García) – showing the contrasting fortunes of two young people being caught up in a world of vice. There was also the background of the enemies fighting to take the place of the falling drug lord, showing the efforts taken to take Escobar out and the vicious attacks taking place throughout Colombia to get back at him. These stories threaded nicely through the series and gave it depth – this wasn’t just the story of one drug kingpin, but of the police, the politicians, the people and the enemies all trying to deal with the game being played with cocaine and Colombia. But what stopped Season 2 from hitting the highs of the first was its’ pacing. Too often the second season fell victim to being too caught up in its’ attempt to show just how hard it was to catch Escobar. Time and again a tip turns into a raid which fails to show up the guy they’re looking for – and while the drama is there in spades, when it happens again and again without a payoff it makes it less interesting to watch. For me, Pablo’s confinement to the lavish La Catedral prison would have made the perfect break-point in the Escobar chapter of Narcos, leaving plenty drama for both seasons whilst having an ending that would have worked well for Season 1. Narcos has been another Netflix success, but like several of its’ other shows the question now is where does it go from here? Netflix is still living off the luxury of being the new kid on the block – but it doesn’t have the experience yet of having a show hang on for just too long. With some of the events at the end of Narcos Season 2 hinting at another bite at the Colombian cherry, it runs the risk of being a show that outstays its’ welcome and tarnishing the legacy of what it claimed to be. In that case, Netflix would be wise to do better than its’ anti-hero Pablo Escobar – and quit while its’ ahead. Narcos season 2 was another great entry in Netflix’s growing catalogue of amazing TV collections, but even though its’ gripping story captured my interest for another year its’ conclusion lacked the vision needed to make it the classic it so well could have been.